(Newser) – Each identical triplet is so tiny she can fit in her father's hand—and soon these rare medical wonders in Oregon will have painted toenails so the new parents can tell them apart. 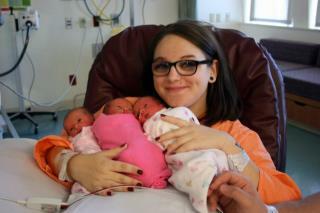 The AP reports Logan Brown-Fletcher and Amber Hills, 19-year-old high school sweethearts and first-time parents from Newberg, welcomed identical girl triplets Raelyn, Avery, and Elaina on Monday. Their neonatologist, Dr. Craig Novack, tells the Oregonian that identical triplets are so rare he's only seen one other set in his 22-year career. Fiancé - funny, I checked, no engagement announcement in the local paper and no engagement ring. More like an uncommitted baby daddy. Next thing you know they'll call him her partner, sheesh.